Smith Middle School students and staff were recognized for being Outstanding Youth in Philanthropy for ages 5-17 by the Dayton chapter of the Association of Fundraising Professionals. 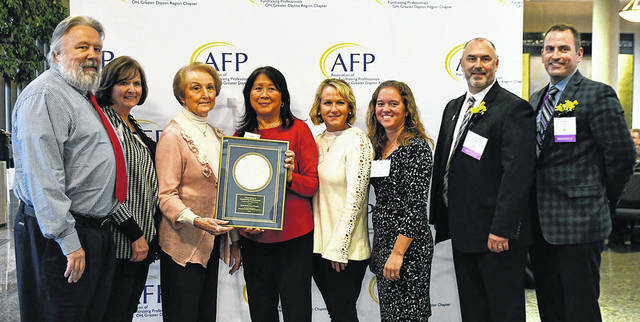 Pictured left to right are John Schmidt, Denise Palen, Marilyn Slusser, Rose Chinn, Kim Imwalle, Renee Cope, Ryan Rogers, and Rob O’Leary. DAYTON — Smith Middle School staff and students were recently recognized by the Greater Dayton Region Chapter of the Association of Fundraising Professionals for Outstanding Youth in Philanthropy ages 5-17 during National Philanthropy Day celebrations. Over the past 30 years, students at Smith have raised thousands of dollars for A Special Wish Foundation and have granted many wishes for recipients.